What Are Hives On Face? Hives on face are raised, flat-topped bumps that are smooth to the touch. They’re typically red in color and commonly referred to as Facial Hives. Hives on face are usually not a one-time event, but a sign of what is to come in the future. What Causes Hives on Face? Most of the time, the cause of hives on the face is never identified with 100% accuracy. However, there are some common triggers for facial hives such as: Food allergies, Drug allergies, Toiletries, Cold, heat, Insect stings and bites, injury to your face etc. Symptoms of Facial Hives They can occur anywhere on your face and neck, including the lips, eyes, and ears. They are often incredibly itchy and are usually accompanied by a burning sensation when touched. Angio edema Facial hives can also be accompanied by facial swelling that is referred to as Angioedema. It is not uncommon for this swelling to spread to your neck and upper arms. Hives can extend from the face down the neck and onto the shoulders. When inflammation goes down, the skin can be scaly from being swollen and the skin can be sensitive. 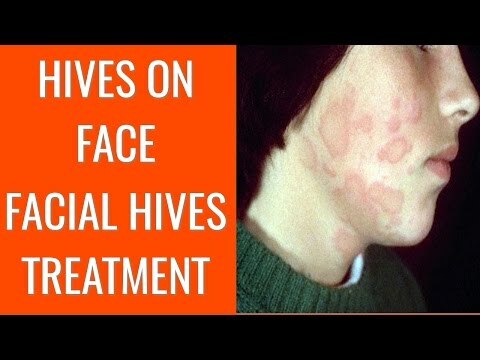 Are The Hives on Face Dangerous? If you find that you are having problems breathing, seek immediate medical help. If you also have a fever, you should contact your primary care physician to discuss treatment options. How to Get Rid of Facial Hives? For temporary relief of hives on your face, wash your face with cold water 3-4 times. Applying a cold compress should also provide temporary relief by reducing the swelling in your face. 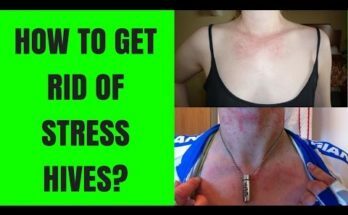 How to Get Rid of Stress Hives? 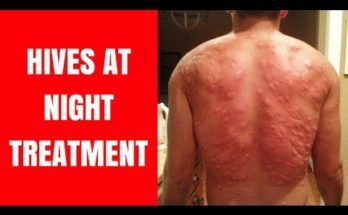 – Stress Hives Treatment – How to Get Rid of a Stress Rash Fast?